Received: Thirugnanasambandhama K, Sivakumar V, Marcelino LG. Application of Plackett-Burman Design to Extract Polysaccharide from Soy Bean Hulls Using Microwave. Biotechnol Ind J. 2016;12(10):105. The main objective of the present study is to investigate the efficiency of microwave to extract the polysaccharide from soy bean hull. Plackett–Burman design was used to screen the effective process variables among weight of the sample (g), concentration of NaOH (%), microwave power (W), agitation speed (rpm), extraction time (min), temperature (°C) and volume of solvent (ml). Box-Behnken design (BBD) was used to study the individual and interactive of process variables on the polysaccharide yield. Optimum conditions for maximizing the polysaccharide yield was determined using Derringer’s desired function methodology as follows: Sample weight of 3 g, microwave power of 300 W, extraction time of 5 min and temperature of 45°C. Under these optimal conditions, predicted polysaccharide yield was found to be 27%. Fourier transform infrared spectroscopy (FTIR) was used to obtain vibrational spectra and the results indicated the presence of polysaccharide. This result confirms the effectiveness of microwave to extract the polysaccharide from soy bean hull. Polysaccharides, widely distributed in plants, animals, and microorganisms, are interesting sources of additives for food and drug industry, due to their unique biological activities and chemical structures . Especially, the biological activities on the antitumor effects have attracted more attention recently in the biochemical and medical fields. Particularly, polysaccharides from the soybean have significant antihyperglycaemic and antihyperlipidemia activities . Soy hulls are a major byproduct in the soybean processing industry and the insoluble carbohydrate fraction contains 50% hemicelluloses, 30% pectin, and 20% cellulose. Therefore, the soy hull is a potential commercial source of polysaccharides . In last few decades, various technologies such as soxhlet, solvent, ultrasound extraction methods were used to extract bioactive polysaccharides from soy bean hull . But, these extraction techniques show disadvantages including lower extraction efficiency, increased operating cost and abnormal extract quality  Therefore, there is a critical need to design a favorable technique to extract polysaccharides from soybean hull, effectively. Nowadays, microwave assisted extraction (MAE) is widely used to extract polysaccharides from various kinds of plant materials due to its enhanced extraction efficiency, when compared to other conventional methods . When microwave assisted extraction is used to extract the polysaccharide, two principal mechanisms are simultaneously functioning. One of these is a rapid increase in temperature, which reduces emulsion viscosity and breaks the outer film of plant material, thus improve the extraction yield. The other one is molecular rotation, which neutralizes the Zeta potential and hence extraction yield is increased . In addition, the process variables in MAE such as weight of the sample, microwave power and extraction times are significantly affecting the process efficiency. The optimization of these parameters will increase the yield of polysaccharide, significantly . Among the various groups of statistical designs, the Plackett–Burman design can be used in preliminary studies for the detection of influential factors on the response value . These factors can be fixed or eliminated in further optimization processes involving second-order models. Response surface methodology (RSM), as an effective statistical tool, can be used to evaluate interactions among various factors, as well as simultaneously estimate the effects of several process variables and their interactions on response variables. RSM has been applied successfully to improve and optimize the bioactive compound extraction process . However, to the best of our knowledge, MAE to perform the extraction of polysaccharide from soy bean using response surface methodology (RSM) via Plackett–Burman factorial designs (PB) has not yet described in literature. Hence, in this study an attempt was made to investigate the efficiency of microwave to extract the polysaccharide from soy bean hull as a function of operating variables such as weight of the sample (g), concentration (%), microwave power (W), agitation speed (rpm), extraction time (min), temperature (°C) and volume of solvent (ml). The Plackett–Burman factorial designs (PB) allows for the screening of main factors from a huge number of process variables, and these designs are thus pretty useful in preliminary studies in which the principal objective is to select variables that can be fixed or eliminated in further optimization processes. 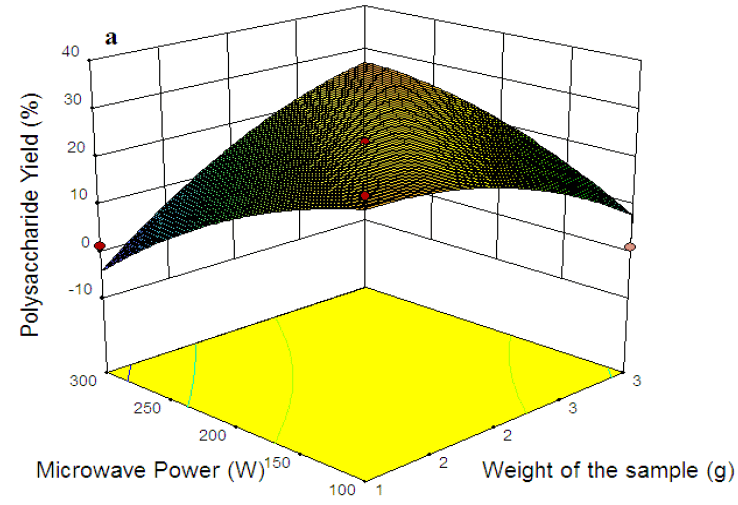 In addition, response surface methodology (RSM) coupled with BBD is an efficient strategic experimental tool by which the optimal conditions of a multivariable system may be determined. Therefore, PB and BBD designs were employed to study and optimize the process variables for the maximum polysaccharide yield. The soy bean hull used were collected from Pollachi, TamilNadu and dried in the room temperature. Sodium hydroxide (NaOH) all other chemicals reagents used were of analytical grade and purchased from local suppliers, Erode. Where, X is weight of polysaccharide and Z is soy bean hull weight. The screenings of process variables for extraction were evaluated using Plackett–Burman statistical design. This is a fraction of a two-level factorial design and allows the investigation of ‘n-1’ variables with at least ‘n’ experiments. Four factors were screened in twelve combinations which will provide an adequate estimate of the error and all the trial experiments were performed in duplicate and the average of observation was used as the response of the design. This design requires that the frequency of each level of a variable should be equal and that in each test, the number of high and low variables should be equal. Then the effect of changing the other variables was cancelled out when determining the effect of particular variable. The main effect was calculated as the difference between the average of measurements made at the high setting (+1) and the average of measurements observed at low setting (−1) of each factor. Plackett–Burman experimental design is based on the first order model and this model describes no interaction among factors. It is mainly used to screen and evaluate the important factors that influence extraction process. The factors that have confidence level above 95% are considered the most significant factors that affect the process. After the screening of process variables, Box-Behnken design (BBD) was used to optimize and examine the influence of effect process variables on yield of polysaccharide. All the statistical analyses were carried out with Stat-Ease Design Expert 8.0.7.1. Experimental runs were established based on a BBD and the complete design consists of 29 experiments were designed and the BBD experimental data was analyzed by multiple regression analysis . Then, the individual and interactive effects of process variables on the extraction process were studied by constructing three dimensional (3D) response surface plots. Finally, optimization of process variables for maximum polysaccharide yield was carried out by derringer’s desired function methodology using numerical optimization technique . FT-IR spectroscopy of crude extract was tested using FTIR Spectrometer. One part of crude sample was mixed with 99% of dried potassium bromide (KBr) powder and compressed to prepare a salt disc of 3 mm diameter. These discs were subjected to FTIR spectrum measurement in the frequency range of 400 cm-1 to 4000 cm-1. Selection of effective process variables to extract polysaccharide from soy bean hull using microwave is important to improve the extraction efficiency, significantly. In order to screen the major influencing variables such as weight of the sample (A), concentration of NaOH (B), microwave power (C), agitation speed (D), extraction time (E), temperature (F) and volume of solvent (G) on polysaccharide yield, Plackett–Burman (PB) design is used and their process variables are listed in Table 1. Table 1. Process variables of Plackett-Burman design. The PB design matrix consists of 12 experimental runs and the corresponding response namely polysaccharide yield (Y1, %) are shown in Table 2. Then the PB design is analyzed by regression analysis and the estimated effects and coefficient of process variables is shown in Table 3. Table 2. Plackett-Burman design and their results. Table 3. Estimated effects and coefficient of process variables for Plackett-Burman. From the results, it is found that among the seven variables tested, weight of the sample (A), microwave power (C), extraction time (E) and temperature (F) exhibited positive effect, whereas the other variables, that is, concentration of NaOH (B), agitation speed (D) and volume of solvent (G), exerted negative effects on extraction process. These results indicate weight of the sample (A), microwave power (C), extraction time (E) and temperature (F) are the effective process variables to extract polysaccharide from soy bean hull using microwave . Table 4. BBD and their results. Where, Y1 is yield of polysaccharide. In order to validate the adequacies of developed mathematical models, experimental values were selected randomly from selected process variable ranges and are plotted with model predicted versus actual plots (Figure 1 and 2). 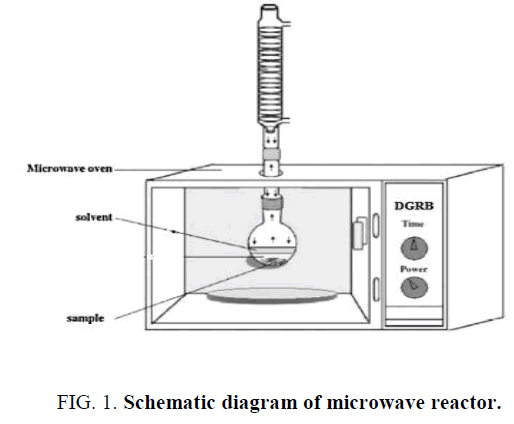 Figure 1: Schematic diagram of microwave reactor. 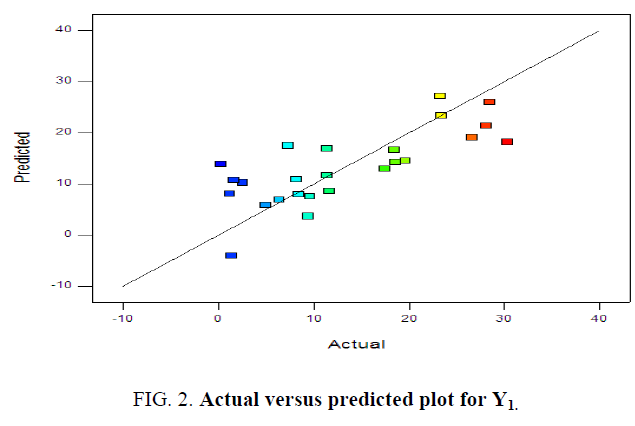 Figure 2: Actual versus predicted plot for Y1. This plot helps us to find out the connection between predicted and experimental values. The data a point on this plot lies very close to the diagonal line indicates the good adequate agreement between experimental data. Moreover, P (<0.0001) and F (>2) values of response indicates the suitability of developed mathematical models. From these results, it is concluded that the developed mathematical model can describe the extraction process, very robustly. After the checking of adequacy of the developed mathematical models, which is used to create the three dimensional (3D) response surface plots (Figure 3a and 3b) in order to study the individual and interactive effect of the process variables on the polysaccharide yield . 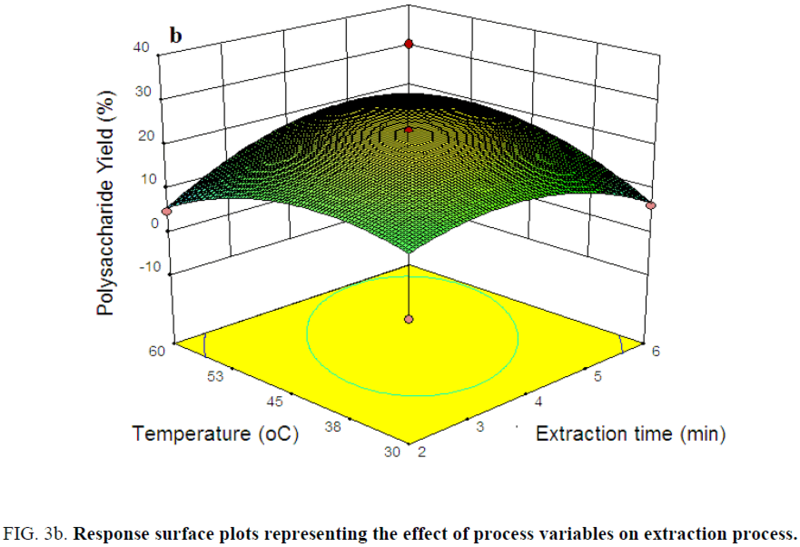 Figure 3a: Response surface plots representing the effect of process variables on extraction process. Figure 3b: Response surface plots representing the effect of process variables on extraction process. Weight of the sample is one of the crucial parameter which influences the extraction of polysaccharides from soy bean hull. In order to investigate the effect of weight of the sample on the polysaccharide yield, experiments were done in various sample weight ranges from 1 g to 3 g and the results are shown in Figure 3a. From the results, it was observed that, the polysaccharide yield is increased linearly with increasing weight of the sample up to 2.5 g. This can be explained by the fact that, increases in sample weight would enlarge the larger surface area to the constant microwave irradiation and enhances the extraction efficiency. However, weight sample beyond 2.5 g shows negative impact on the polysaccharide yield [12,18]. Microwave power is the crucial factor which influences the polysaccharide yield from soy bean hull, significantly. So that experiments were conducted to study the effect of microwave power (100 W to 300 W) on the polysaccharide yield. From the results, it is observed that, the yield of polysaccharide is increased linearly with increasing microwave power from 100 W to 250 W (Figure 3a). Microwave technique consists of the penetration of microwave energy into the soy bean hull, which produces a volumetrically distributed heat source due to molecular friction. This resulting from dipolar rotation of polar solvents and from the conductive migration of dissolved ions, accelerating the mass transfer of target compounds. Therefore, extraction yield of are polysaccharide enhanced [15,19]. Extraction time is one of the key process variables for the extraction of polysaccharides from soy bean hull using microwave. To examine its effect on yield of polysaccharide, experiments were carried out in various extraction time (2 min to 6 min) and the results are shown in Figure 3b. From the observations, it is found that, the polysaccharide yield is increased rapidly with increasing the extraction time up to 5 min. This phenomenon could be explained by that, the increase in extraction time increases the reactive site to the effective extraction process, which improves the polysaccharide yield. Beyond 5 min of extraction time shows the negligible effect on the yield of polysaccharide from soy bean hull sample . Temperature is one of the most important parameter that affects the extraction process, significantly. In order to study the effect of temperature on polysaccharide yield from soy bean hull, experiments were carried out in various temperature and results are depicted in Figure 3b. From the results, it is found that polysaccharide yield from soy bean hull is decreased beyond temperature of 50°C . In order to find out the optimum operating conditions to extract polysaccharide from soy bean hulls using microwave, simultaneous optimization of the multiple responses is carried out using numerical optimization technique. Optimum conditions for maximizing the polysaccharide yield was determined using Derringer’s desired function methodology  as follows: sample weight of 3 g, microwave power of 300 W, extraction time of 5 min and temperature of 45°C. Under these optimal conditions, predicted polysaccharide yield was found to be 27%. FTIR analysis is used to find out the functional groups present in the crude extract. The FT-IR spectrum of crude polysaccharide extracted from soy bean hull is shown in Figure 4. This has strong peaks at 3430 cm-1 attributed to the complex stretching vibrations of free and intermolecular bonded hydroxyl groups and carboxylic acid groups which make up the gross structure of carbohydrates. The spectrum of crude extract shows the carboxylate ion peaks at 1600 cm-1. The peak at 1414 cm-1 belongs to O–H bending of water. The carbohydrate peaks at 1140 cm-1 and 1100 cm-1. The peaks at 1060 cm-1 and 990 cm-1 are C–O stretching vibration. These results have been confirmed that presence of polysaccharide group in crude extract. 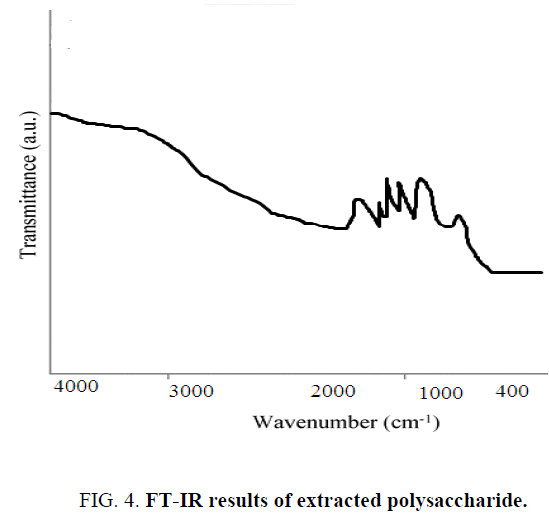 Figure 4: FT-IR results of extracted polysaccharide. Extraction of polysaccharide from soy bean hulls using microwave was investigated via Plackett–Burman design (PB) and Box-Behnken design (BBD). The various effects of the factors were studied by β-coefficient and Fischer’s F-test for analysis of variance (ANOVA) and a second order model was developed. Optimum conditions for maximizing the polysaccharide yield was determined using Derringer’s desired function methodology as follows: sample weight of 3 g, microwave power of 300 W, extraction time of 5 min and temperature of 45°C. Under these optimal conditions, predicted polysaccharide yield was found to be 27%. The FTIR analysis confirms the functional groups of polysaccharide in crude extract. Andallu B, Shankaran M, Ullagaddi R, et al. Rotary magnetic field combined with pipe fluid technique for efficient extraction of pumpkin polysaccharides. J Herb Med.2014;4:10-7. Huang J, Lu XQ, Zhang C, et al. Anti-inflammatory ligustilides from Ligusticum chuanxiong Hort.Fitoterapia.2013;91:21-7. Or TC, Yang CL, Law AH, et al. Isolation and identification of anti-inflammatory constituents from Ligusticum chuanxiong and their underlying mechanisms of action on microglia. Neuropharmacology.2011;60:823-31. Liu H, Wang FY,Liu YL. Hot-compressed water extraction of polysaccharides from soy hulls. Food Chemistry. 2016;202:104-9. Tang JC, Zhang JN, Wu YT, et al. Effect of the water extract and ethanol extract from traditional Chinese medicines Angelica sinensis (Oliv.) Diels, Ligusticum chuanxiong Hort. and Rheum palmatum L. on rat liver cytochrome P450 activity. Phytother Res. 2006;20:1046-51. Hobbs C. Medicinal value of Lentinusedodes (Berk.) Sing. (Agaricomycetideae). A literature review.Int J Med Mushrooms.2000;2:287-302. Yoon SJ, Yu MA, Pyun YR, et al. The nontoxic mushroom Auriculariaauricula contains a polysaccharide with anticoagulant activity mediated by antithrombin.Thromb Res.2003;112:151-8. Wu Q, Tan Z, Liu H. Chemical characterization of Auriculariaauricula polysaccharides and its pharmacological effect on heart antioxidant enzyme activities and left ventricular function in aged mice.Int J BiolMacromol.2010;46:284-8. Fan LS, Zhang SH, Yu L,et al. Evaluation of antioxidant property and quality of breads containing Auriculariaauricula polysaccharide flour. Food Chem.2006;101:1158-63. Kakuta M, Sone Y, Umeda T. Comparative structural studies on acidic heteropolysaccharides isolated from ‘Shirokikurage’, fruit body of TremellafuciformisBerk, and the growing culture of its yeast-like cells.AgricBiol Chem. 1979;43:1659-68. Song G, Du Q. Isolation of a polysaccharide with anticancer activity from Auriculariapolytricha using high-speed countercurrent chromatography with an aqueous two-phase system. J Chromatogr A.2010;1217:5930-4. Marti C, Roeckel M, Aspe E, et al. Recovery and characterization of proteins precipitated from surimi wash-water. Chemistry. 1994;29:39-46. Chung H, Kim J, Kim J, et al. Extraction optimization, preliminary characterization and immunological activities in vitro of polysaccharides from Elaeagnusangustifolia L pulp. J Funct Foods. 2013;8:1502-6. Zhu X, Raina AK, Lee HG, et al. A carboxy methyl tamarind polysaccharide matrix for adhesion and growth of osteoclast-precursor cells. Brain Res. 2004;1000:32-9. Maran JP, Sivakumar V, Thirugnanasambandham K, et al. Response surface modeling and analysis of barrier and optical properties of maize starch edible films. Int J Biol.Macromol. 2013;62:412-21. Sridhar R, Sivakumar V, Prince Immanuel V,et al. Treatment of pulp and paper industry bleaching effluent by electrocoagulant process. J Hazard Mater.2011;186:1495-1502. Bourtoom T, Chinnan MS, Jantawat P, et al. Recovery and characterization of proteins precipitated from surimi wash-water. LWT - Food SciTechnol. 2009;42:599-605. Jeszka-Skowron M, Flaczyk E, Jeszka J, et al. Antioxidant properties of Paratha type flat bread enriched with white mulberry leaf extract. JFunct Foods.2013;5:1620-32. Thirugnanasambandham K, Sivakumar V, Prakashmaran J. Optimization of electrocoagulation process to treat biologically pretreated bagasse effluent. J Serb Chem Soc. 2014;79:613-26. Park E, Min Lee S, Lee J, et al. Anti-aging Potential of Extracts Prepared from Fruits and Medicinal Herbs Cultivated in the Gyeongnam Area of Korea. JFunct Foods.2013;5:178-86. Maran JP, Sivakumar V, Thirugnanasambandham K, et al. Degradation behavior of biocomposites based on cassava starch buried under indoor soil conditions. Int J BiolMacromol. 2014;101:20-8. Tehila TS, Margalit B, Dorit VM, et al.Antioxidant activity of the polysaccharide of the red microalga Porphyridium sp. J ApplPhycol. 200;517:215-22.